1 Program features and availability may vary by country. 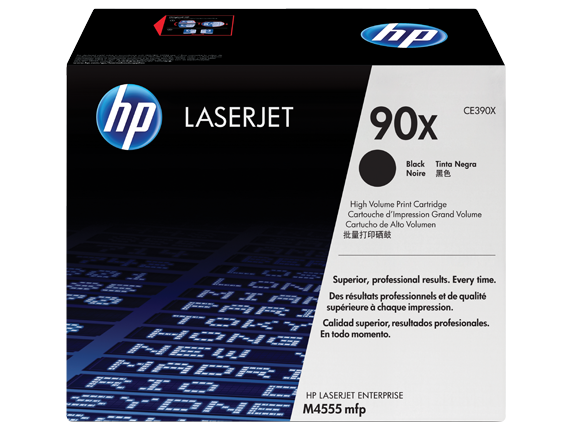 For more information, visit http://www.hp.com/learn/suresupply 2 Energy savings based on comparing conventional toner and print system used in HP LaserJet M4345 MFP series with energy-efficient HP toner and print system used in HP LaserJet Enterprise M4555 MFP series. Testing per Energy Star Typical Electricity Consumption test. Actual savings may vary. 3 Compared with 1992 baseline. 4 Program availability varies. HP toner cartridge return and recycling is currently available in more than 50 countries and territories around the world through the HP Planet Partners program. For more information, or to request return envelopes and bulk collection boxes, visit http://www.hp.com/recycle. 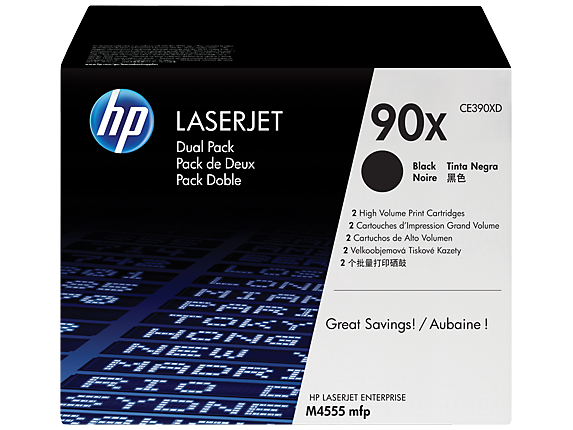 5 The HP 90X LaserJet Black Toner Cartridge not included; please purchase separately. 6 Declared yield based on ISO/IEC 19752 and continuous printing. Actual yields vary considerably based on images printed and other factors. For details see http://www.hp.com/go/learnaboutsupplies. 1 Program features and availability may vary by country. 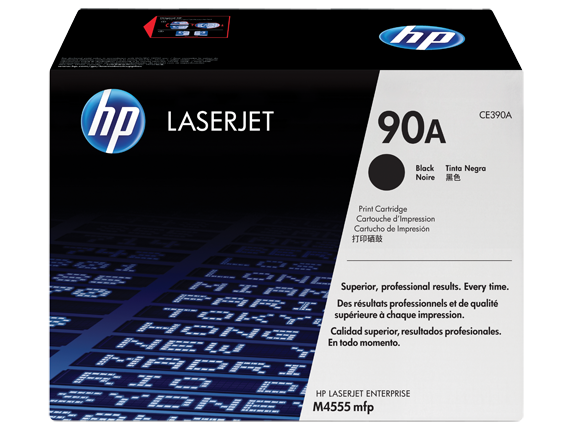 For more information, visit http://www.hp.com/learn/suresupply 2 Energy savings based on comparing conventional toner and print system used in HP LaserJet M4345 MFP series with energy-efficient HP toner and print system used in HP LaserJet Enterprise M4555 MFP series. Testing per Energy Star Typical Electricity Consumption test. Actual savings may vary. 3 Compared with 1992 baseline. 4 Program availability varies. HP toner cartridge return and recycling is currently available in more than 50 countries and territories around the world through the HP Planet Partners program. For more information, or to request return envelopes and bulk collection boxes, visit http://www.hp.com/recycle. 5 Declared yield based on ISO/IEC 19752 and continuous printing. Actual yields vary considerably based on images printed and other factors. For details see http://www.hp.com/go/learnaboutsupplies. 1 Program availability varies. Original HP cartridge return and recycling is currently available in more than 50 countries, territories, and regions in Asia, Europe, and North and South America through the HP Planet Partners program. For more information, visit http://www.hp.com/recycle. 2 Declared yield based on ISO/IEC 19752 and continuous printing. Actual yields vary considerably based on images printed and other factors. For details see http://www.hp.com/go/learnaboutsupplies.